Greenwich’s Martine Fierro serves in her 6-2, 6-2 victory over Fairfield Ludlowe’s Samantha Keane 6-2, 6-2 on Monday. 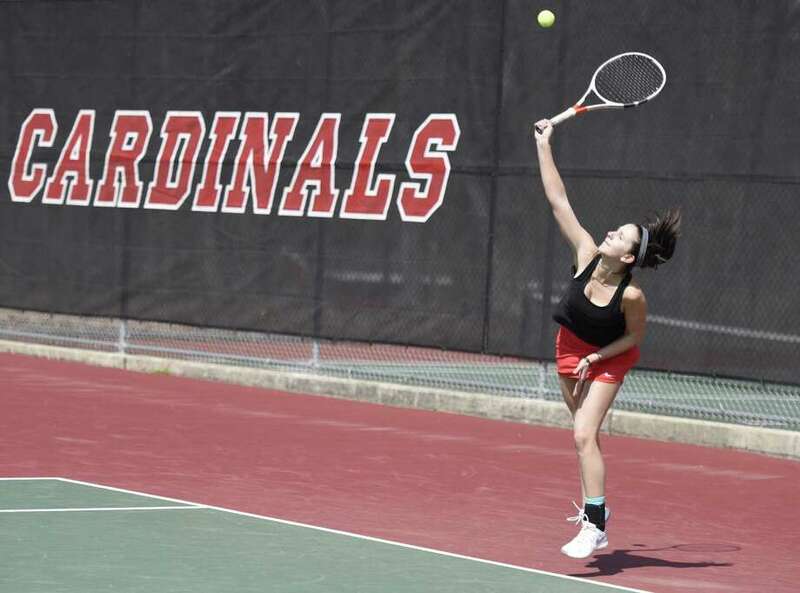 GREENWICH — The temperature was in the mid- to upper-30s throughout Monday’s girls high school tennis match between Greenwich and Fairfield Ludlowe, but it certainly didn’t affect the quality of play from these FCIAC rivals. Most of the points in the match were well contested and just as last season, the Cardinals had the advantage. Displaying its depth, Greenwich improved to 2-0 on the young season, defeating visiting Ludlowe in a late-morning matchup 7-0. The Cardinals and Falcons met three times last season, with Greenwich going 3-0, including victories of 6-1 and 5-2 in the FCIAC and Class L tournaments, respectively. Fierro, who is in her first season at No. 1 singles, posted a 6-2, 6-2 win over Ludlowe senior Samantha Keane. Leading 3-2 in the opening set, Fierro held serve, then broke, to take a 5-2 advantage. An ace by Fierro in the ensuing game capped the first set. In the second set, Fierro took the last four games and the match. Senior co-captain Melanie Murphy and sophomore Amy Bickham gave Greenwich a 6-4, 6-4 victory at No. 2 doubles, beating juniors Grace Cogasn and Heather Moran. This marks the first season Murphy and Bickham are teaming up. The longest match came at third singles, with GHS junior Christina Gianesello and Falcons freshman McKenna Carroll playing a marathon, 2-hour, 15-minute match. Gianesello prevailed, 4-6, 6-3, 6-1. At first doubles, senior Hannah Crasto and sophomore Kendall Schrohe of Greenwich edged sophomore Kaitlyn Yoon and junior Heather Moran, 4-6, 6-2, 6-1. Crasto and Schrohe competed at second doubles last spring. Yoon and Moran held serve, then broke, to take the first set. Second singles saw sophomore Melanie Leguizamon post a 6-2, 6-2 win against junior Xenia Efimov. Sophomore Yuri Inagawa was victorious at fourth singles, beating junior Katie Coolidge, 6-4, 6-2 and the Cardinals’ duo of freshman Abby Shropshire and junior Catherine Daye (No. 3) won their match, 6-2, 6-1. At Greenwich. Singles: Martine Fierro (G) def. Samantha Keane 6-2, 6-2; Melanie Leguizamon (G) def. Xenia Efimov 6-2, 6-2; Christina Gianesello (G) def. McKenna Carroll 4-6, 6-3, 6-4; Yuri Inagawa (G) def. Katie Coolidge 6-4, 6-2; doubles: Hannah Crasto/Kendall Schrohe (G) def. Kaitlyn Yoon/Emily Cheung 4-6, 6-2, 6-1; Melanie Murphy/Amy Bickham (G) def. Grace Cogan/Heather Moran 6-4, 6-1; Amy Shropshire/Catherine Daye (G) def. Caitlin Chen/Kate Alaniello 6-2, 6-1. Records: Greenwich 2-0; Ludlowe 1-1.